Limited Edition: 300 bottles. Customers of this edition will be exclusively invited to reorder this fragrance in the future. A riot of plants sweating in the morning sun. The scent of young ginger sweeping through the green canopy. Brewed tea and fresh tobacco leaves. An oncoming thunderstorm and the purifying crispness that follows. Follow Moena 12|69 from forest to fragrance. 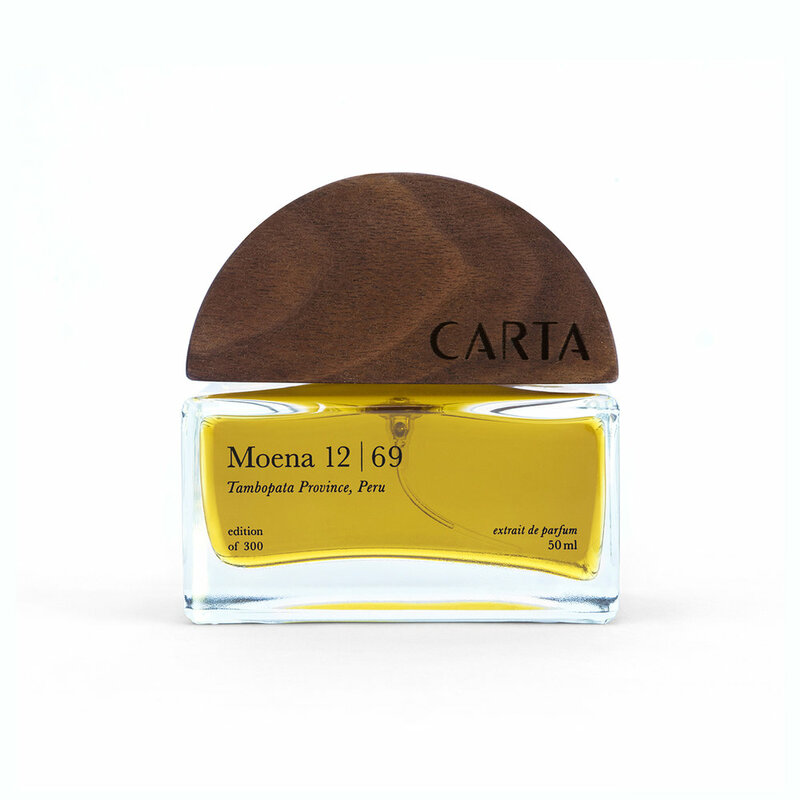 Carta's premier offering, Moena 12|69, is the first ever fragrance to feature Moena Alcanfor, a rare essential oil steam-distilled from the lateral branches and leaves of Moena trees. The numbers correspond to the geographical coordinates from where the oil is sourced - the Tambopata Province of the Peruvian Amazon at 12.58° South, 69.19° West. A close botanical relative to the highly endangered Rosewood (another Amazonian tree popular for fragrance), Moena Alcanfor is a new sustainable alternative. This oil is ushering in a promising future for the region’s delicate ecosystem. Its woodsy aroma ignites emotions, purifies and uplifts the spirit, and eases anxiety. A portion of the proceeds from Moena 12|69 sales are returned to Camino Verde, the only organization in the world distilling Moena Alcanfor. Learn more about Camino Verde’s valuable work here. Moena 12|69 is made in small batches and bottled to order. The Carta signature bottle cap is crafted at Wood Thumb, San Francisco from reclaimed walnut wood. Each bottle is placed in a hand-numbered box constructed from recycled fibers and then wrapped in recycled tissue and biodegradable materials before posting. Sillage: 6 + hours. Moena 12|69 is a highly concentrated scent. A bottle lasts a very long time. Usage: To best enjoy your fragrance, apply sparingly to pulse points.